Does a 'grass' have dominion over you? Are you struggling with SMOKING? Do you want to know how to quit? Read the following short story from Julie's testimony; a story which is not in the book. . .
Julie had smoked her first cigarette at a young age and throughout the years, other than her three pregnancies, she could always be found with a 'fag' or a 'joint' in her hand. When in her forties she found herself in a police cell, arrested for attempted murder. She came to a place where she was at the end of herself and she cried out to God. God heard her cry, which was a desperate heart's cry to the living God she had once met. He came to her in that cell and gave her assurance that the truth would set her free. The solicitor, who was a smoker himself, came in to prepare her for questioning. During the process, he offered her a cigarette. Julie accepted it and tried to draw on it but it tasted vile to her so she threw it on the floor. She looked at it lying there and decided to try again. Again, it tasted vile and she could not smoke it. 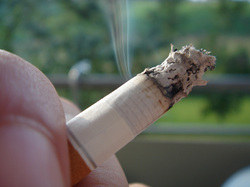 Several times she tried to smoke that cigarette but each time she tossed it away, which puzzled her at the time. But in hindsight she is clear: God had visited her and she had met with Him. God had transformed her and she could no longer even draw a good taste from a fag. Recently when giving this testimony in a church, a woman who had been struggling with smoking for years came to Julie after the meeting for prayer. She was desperate to give up the habit. Julie gave her some refreshing and godly advice: "Get down on your knees, repent and say sorry to God for filling yourself, His temple, with that rubbish. Then pray through to Him and promise Him that you will not touch another cigarette again and God in His faituhfulness will see you through!" Refreshing, for seldom these days do we hear that we are responsible for what we do with these bodies God has given to us for this short time on earth. We are responsible and by God's grace we are able to choose self-control. "It tasted like the sheep dip!" HERE'S ANOTHER SIMILAR TESTIMONY: A 55-year-old farmer from County Down, in Northern Ireland, went to a tent mission to wreck the meeting; he was angry with these Gospel preachers. But instead of wrecking the meeting, his life was miraculously changed as he met Jesus Christ that night. When trying to smoke his pipe the next day, he tasted that something was wrong with the tobacco and thought that perhaps the sheep dip had affected it, so he re-filled his pipe. Yet again the same foul taste, so he sent his wife to get some more tobacco for him from the local shop. When she returned with the new tobacco and he refilled his pipe, the same rotten taste came to his tastebuds. At that moment, he knew that this was a result of meeting His Saviour the night before. To his delight he threw away the tobacco and the pipe and never smoked it another day! Yes, God would not have us even smoke a pipe! 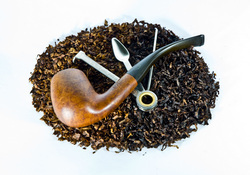 Just because Charles Spurgeon did, does not mean that it is righteous to smoke a pipe.